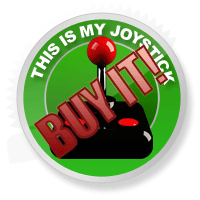 OlliOlli Review - This Is My Joystick! Skateboarding. One pastime my parents wanted me to avoid and for a time, they won. I secretly purchased a skateboard, read about famous skateboarders in magazines and listened to heavy metal and grunge. Oh yeah, I was a really wild child, not. Only thing was I didn’t ever really manage to get past the initial phase of skateboarding, the staying on. Lucky for me, computer games were there to help give me the edge I needed for boasting to my friends. I could talk with experience about spins, nose grabs and Double Pop-shovit Late Kickflips. The new vocabulary began to build from playing California Games on the Mega Drive at a friend’s house, the half-pipe, what a game. Then with the dawn of Tony Hawk’s Pro Skater bringing such a level of realism that I thought I should try skateboarding again for real. I think it was lucky that I didn’t follow through with it, though the pull to skateboard in some fashion or other has always been a strong one to me. A new contender for the best skateboarder game ever enters the half-pipe and it’s called OlliOlli. Introducing it to your Vita is a very pleasant experience indeed. Full of its fair share of tricks, grinds and, most importantly, challenge. There’s a degree of frustration involved, but it’s fun and not annoying, generally speaking. So how does it rank among the big boys? Graphically you could easily consider OlliOlli as being less sophisticated than the likes of Tony Hawk’s or Skate. However, as you play this is soon overlooked and you find they are everything you need and more. The hand drawn…errr… 16bit graphics keep the humour light, helping to retain the fun factor. Each trick is captured in super hand-drawn animations that make OlliOlli flow smoothly. On the face of it OlliOlli is a downhill skater with simple one stick controls. Underneath it’s a punishing mind dexterity game, with stick and buttons combinations that rival fighting games. It’s all too easy to dismiss OlliOlli as just another downhill trick game and I think those that ignore it will miss out on the beauty of OlliOlli’s “just another go” compulsion. I put this down to wanting to beat high scores and improve your own skill along the way. Pulling off new moves, grinds and tricks is all very simple but it comes down to whether you can plant those wheels on the floor successfully enough not to fall off. It’s very much like Joe Danger or Trials HD in this regard. 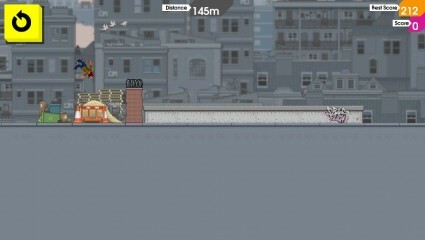 Spread over a number of different backdrops, OlliOlli increases in difficulty as you progress. The learning curve is cleverly managed by the developers Roll7 and, coupled with the training levels, it excels at easing you in gently. Before you know it you’re skating downhill, face planting the floor and restarting in such carefree and reckless abandon that suddenly you’re hooked. Whether you’re consuming each level and its challenges in long sessions or in five minute ‘waiting-for-someone’ pick-up-put-down chunks, OlliOlli is equally at home. Each level has a number of objectives or goals in addition to just making it to the bottom in one piece. Make it to the bottom safely and you are rewarded with the next level being unlocked. The objectives for each level are similar to other games of this style; get a high score or grinding on specific surfaces or successfully pulling off a particular trick. Complete all the goals and you will unlock the pro-mode for that level, containing yet more goals and extending the challenge available considerably. Each area has a unique-but-familiar feel, giving you a good sensation of progression. Combining your tricks soon becomes the method in which you will spend most of your time trying to perfect and, as with real-life, if you get it wrong you bale and that’s the end of your go until next time. One thing I noticed, unless I’m mistaken and missing a trick, was that it is necessary to grind between your tricks to achieve combos. If you don’t grind, you can’t chain more things together. Your only other option is to time your perfect landing, ending that current combination. Get the landing wrong and it’s the yellow retry button for you. The one thing that threw me as I couldn’t commit it to muscle memory, is that to jump you use the left stick and to land you have to press the x button at the right time. This combination proves a little odd at first and certainly if you’re used to Tony Hawk’s, then you’ll have a moment thinking about this new control system. Online gameplay is limited to displaying your high scores against the world’s greatest OlliOlli-ers on each level. A special “Daily Grind” pits you against the world to prove on this very day that you are the best skater in the world. In my case I could see I wasn’t, as already the scores people can achieve are insane. A little more practice though and I might just have it. Just one more go. You can practice the daily grind as much as you like to get your approach and tricks perfected before committing to the final run. Once selected, the pressure is on to not make a mistake else your score will be rubbish and you will prove only that you are in need of more practice. It only takes a split second for everything to go wrong, with a miss-timed jump or over-excitable spin and your mega combo score is suddenly in the tens rather than the hundreds or thousands or even millions. There are two main modes in career and spot. The difference is subtle but spot makes it all about committing one long combined trick to get the highest score possible, whereas career allows you to land in-between each trick, ground permitting. Complete all the challenges on amateur and pro and you’ll apparently unlock RAD mode. I haven’t managed this yet, but I am working on it. Is OlliOlli the best skateboarding game ever? Well, it’s certainly up there with the greats, helped along by its simple-to-pick-up gameplay and strong must-beat-it feeling. 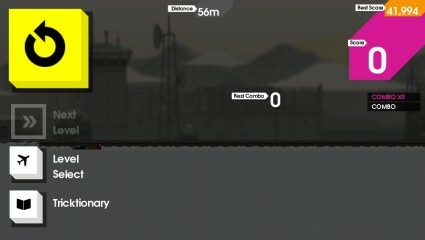 OlliOlli is a true gem and plays perfectly on the Vita. It contains enough challenge and fun to warrant its purchase immediately. If you own a Vita stop reading and buy it now. Buy further copies for your friends so you can beat them with your skating skill prowess. You know you’re a better skater than them, prove it.